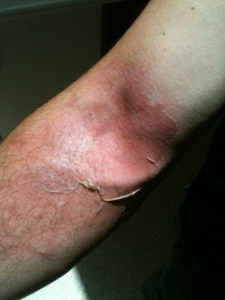 Each year, 5000 people with burn injuries present to emergency departments across Victoria (1). The vast majority of these are minor superficial burns which heal without complication within 10 – 14 days . They heal by a process of re-epithelialization as surviving keratinocytes in the injured skin proliferate to restore the epidermal barrier (regeneration). less than 10%TBSA in adults and less than 5%TBSA in children. Minor injuries do not require referral to a specialist burn service and most can be managed in the community, although some may require inpatient care for dressing and pain management requirements. This section of the guidelines deals with the management of these minor burn injuries.